This recipe is adapted from an old-time favorite of the Silver Palate cookbook. I was skeptical when I first discovered it 20 some years ago but was won over by the delicious blend of flavors. So I gave it my Cuisinicity touch to make it healthier and it became a Katz family staple for all those years….but I just revamped it yet again to make it vegan! I replaced the buttermilk with cashew non-dairy yogurt which has just now appeared on the market…and WOW! (I am not sure if it is available everywhere yet, but click here for the one I found at Whole Foods). 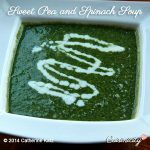 You can make this wonderful soup with fresh mint, fresh cilantro, or fresh basil and serve it either hot in the winter or chilled on a summer evening, just delectable, any which way! 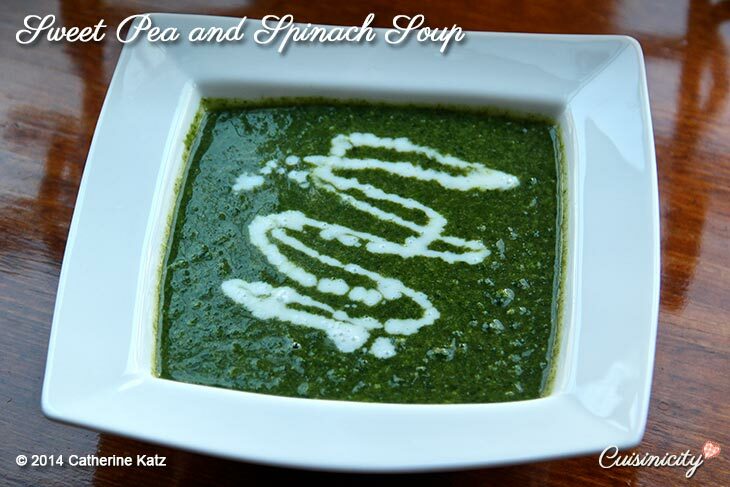 Once the spinach is completely wilted (5-6 minutes), add the peas and water and bring to a quick boil. Turn down the heat, cover and simmer for 10-12 minutes. Turn off the heat and add the fresh mint or cilantro or basil, salt and pepper. Let cool for a few minutes and place the soup in a food processor (you will have to do it in several batches) and process until smooth, or better yet, you can use a stick hand blender to blend the soup to desired creaminess right in the pot (see below). Add the cashew yogurt and briefly heat through while stirring. Ladle the soup in individual bowls with a drizzle of cashew yogurt for a beautiful presentation. 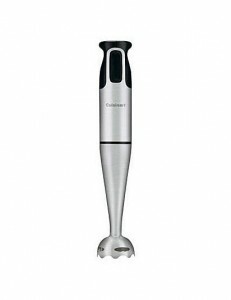 smart stick hand blender-there are many on the market and you don’t need a fancy one, they all work the same way! Catherine:) This soup is so delicious! Yummy! Whole kitchen was full of its pleasant smell and I LOVED the taste! I had high expectations and rightfully so, the recipe is awesome! Perfect combination. Thank you very much for sharing it with us! May God keep you blessed!